So. My family left me for a week. J had some time off in between jobs so she decided to take a few days and go to Florida with the kids. I can’t take vacation right now so I got stuck at home by myself for a few nights while they enjoy the sunshine and 70’s. I decided to take them to Grand Rapids to catch their flight instead of making J go by herself and park a car there. The kids had never flown before so there was a little nervousness by all of us. I stayed with them until they got through security then there was nothing else I could do so I headed back to Kalamazoo. I was trying to get to a brewery before it closed at 6:00 so I got on the road as quickly as I could. I had time to myself and there’s one brewery in Kalamazoo that doesn’t serve food that I haven’t been to. 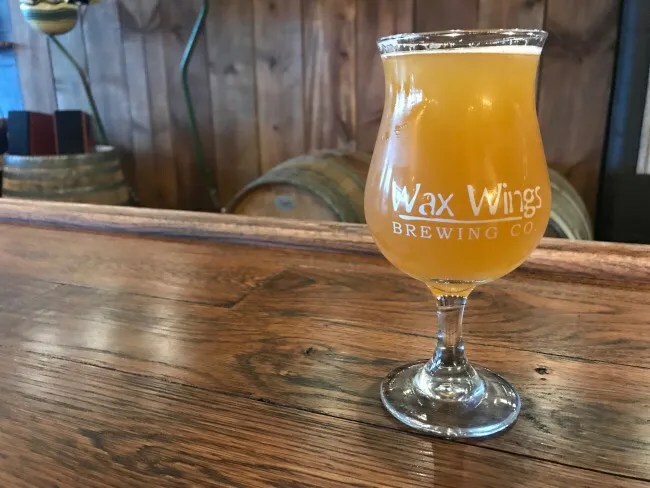 This was my first chance to go out by myself since Wax Wings Brewing Company opened up last June. 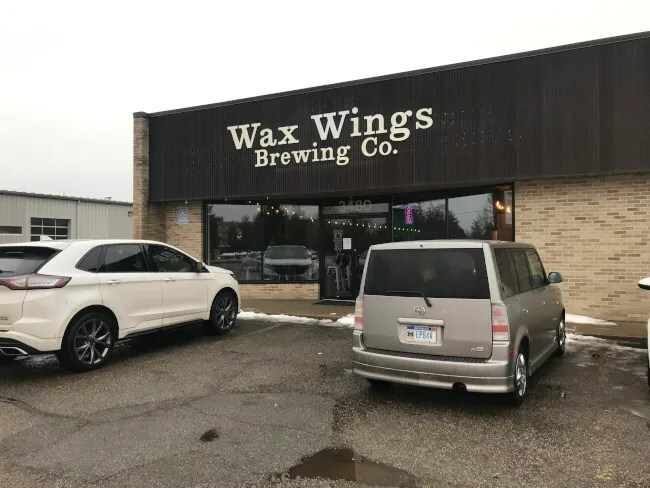 Wax Wings Brewing is on Gull Road just west of Nazareth in the small strip mall with Mi Pueblo. Wax Wings takes up the spot furthest to the east. The space was last used by an Instant Cash place a couple of years ago. I pulled in to the parking lot about 5:15. That gave me about forty five minutes to see what this place had to offer and still gave me time to grab a pizza and get home before kickoff….oh yeah, it was Super Bowl Sunday. There was only one other group in the place when I walked in but a few more guys joined us before closing. 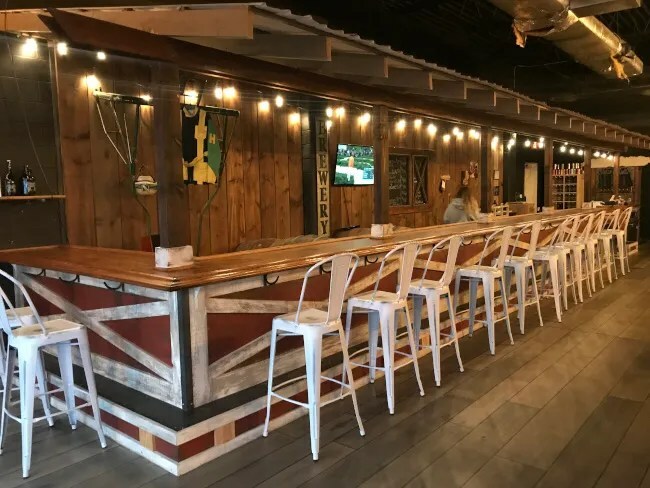 The large bar dominates the space with barn door panels wrapping around the bar which runs most of the length of building. There are white metal pub chairs lined up around the bar. There’s really not much behind the bar…just space and a few barrels…although I don’t know if those are being used or for decoration. A lone TV hangs in the middle of the bar and it was turned to golf instead of Super Bowl pregame for some reason. 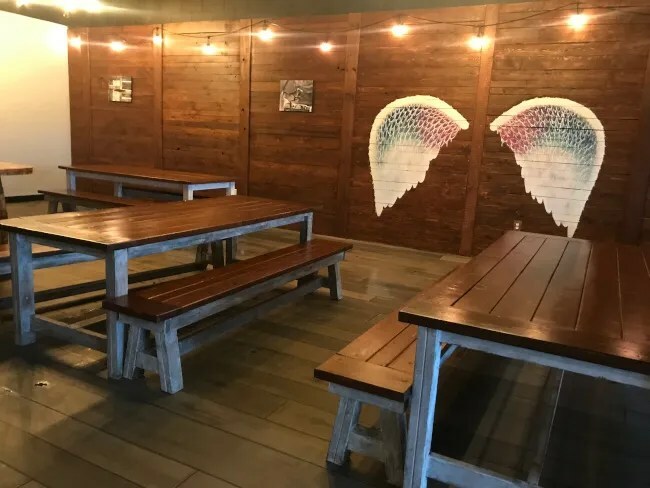 There are also a few picnic tables for the more social people as well as a stack of board games to play. 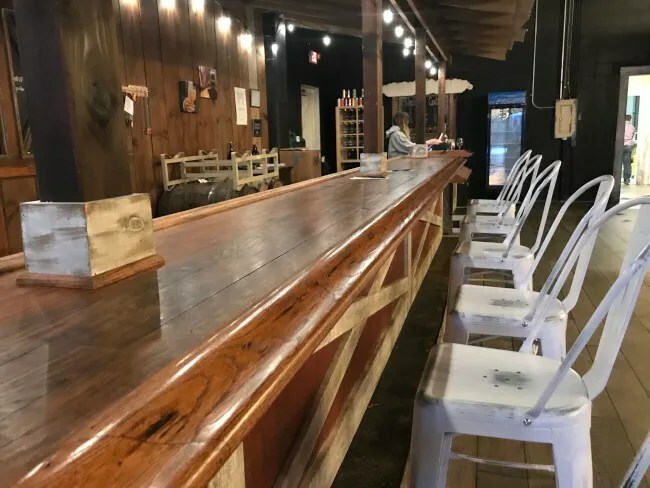 The space really uses a lot of polished wood and has a wedding barn feel to it. There were five beers on tap and they don’t do flights. The bartender did offer me a half pour of each beer if I wanted but that would have added up to a lot more beer than I needed. 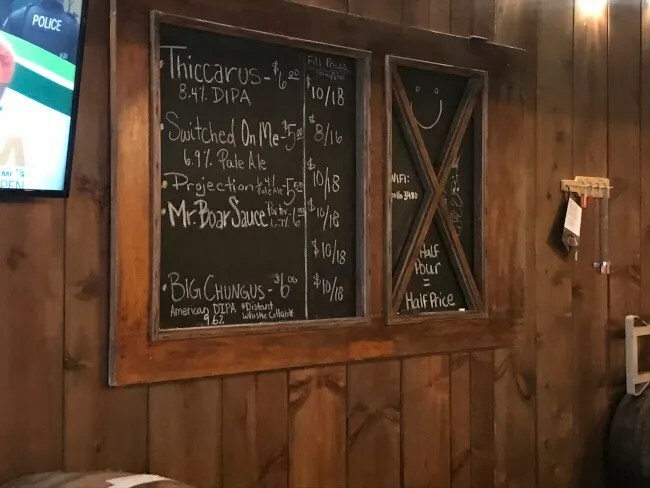 The beer list is written on a chalkboard next to the TV. I decided pretty quickly there were two beers that I wanted to try. I started with the Thiccarus. This Double IPA has a great citrusy taste up front a real hoppiness to it. It’s a pretty solid DIPA. The second beer I tried was the Mr. Boar Sauce. Porter’s are pretty hit or miss for me and this one really hit. There is a smooth chocolatiness to it. I kind of had to chug this one to get out of the taproom before it closed but it was so easy to drink I didn’t have a problem with that. The beers were $6 each so before tip, the tab came out to $12. 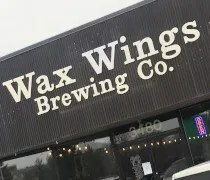 Whenever a new brewery opens up, there’s always people who will cry about over saturation but I love places like Wax Wings. They’re not big breweries. They’re small neighborhood tap rooms. 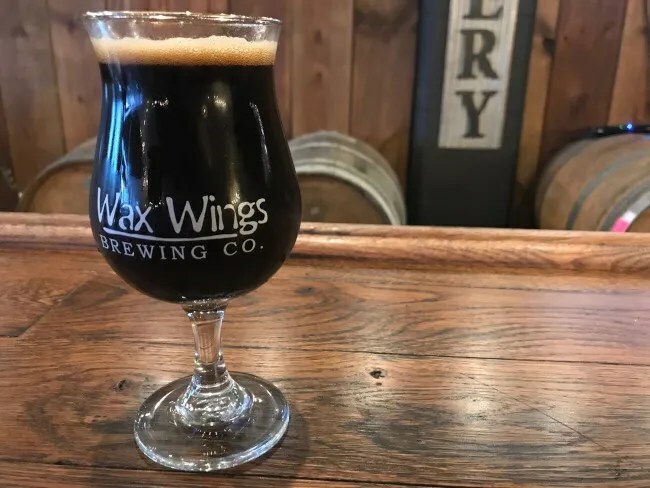 Wax Wings Brewing Company is a great place to relax with friends, play some games, and enjoy some delicious small batch beers.